â€œIf South Africans are afraid of expropriating the land without compensation because of [international] sanctions and backlash, then donâ€™t vote for the EFF,â€ the Commander-in-Chief (CIC) Julius Malema of the Economic Freedom Fighters (EFF) said. â€œWe are not scared because we know for every good there will be pain,â€ he added. Malema was speaking at a media briefing held at the EFF headquarters in Braamfontein on Thursday. 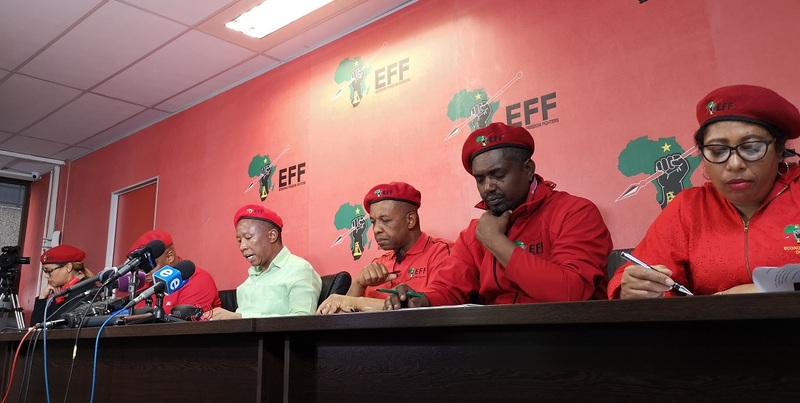 The EFF spoke on a variety of issues including US President Donald Trumpâ€™s infamous tweet, land expropriation without compensation, AfriForum and amnesty for the Fees Must Fall activists. Here are the top takeaways. #EFFmediabriefing The issues being addressed are around the bill on nationalising of the reserve banks, land expropriation without compensation. The first land to be expropriated will be the land which is not being used. Afterwards other land will be expropriated. The EFF will not play public opinion games with the land question, Malema said. He added that it is an emotive issue with people’s dignity at stake and said the South African peoples hopes for the land cannot be subjected to popular opinion on the land question. On Thursday, President Donald Trump tweeted that the US authorities would â€œclosely study South Africa land and farm seizures and expropriations and the large scale killing of farmersâ€ after watching a Tucker Carlson segment on Fox News. In response, the CIC said: â€œWe want to send a strong message to the USA authorities, just like we did to the Australian authorities, stay out of South Africaâ€™s domestic affairsâ€. As a post-colonial country plagued with racial tensions cemented by an apartheid system, South Africa needs its land to restore the dignity and equality of its people. â€œDonald â€˜Pathological Liarâ€™ Trump, we are not scared of you,â€ Malema said. The EFF will not kneel at the foot of the US and its western imperialist forces. Deputy President David Mabuza said on Thursday that government will respond via diplomatic channels to Trump’s tweet. Speaking at a land summit in Bela-Bela, Limpopo, he accused Trump of spreading misinformation about South Africaâ€™s land reform policies. Donald Trumpâ€™s tweet did not scare the EFF, if anything the party is now more determined to pursue land expropriation without compensation. Besides, the farm killings statistics are unfounded. There is no scientific evidence that points to white genocide in South Africa, Malema said. Instead, there is black genocide in the US and in South Africa. The US gets its information about farm murders and seizures and white genocide from AfriForum. Malema said AfriForum is like an embassy of the US. It is an organisation that exists to protect white supremacy, he said. â€œWe are not scared of AfriForum,â€ Malema added. Like AfriForum, the African National Congress (ANC) – specifically those who support President Cyril Ramaphosa – and the Democratic Alliance (DA) want to protect white interests. Malema said the EFF suspects that the groups want to lobby the international support against land expropriation without compensation. Both Cyril Ramaphosa and the South African Communist Party do not believe in land expropriation without compensation, he said. Malema added that at least AfriForum is blatant in its disapproval. The ANC, however, is not. If the ANC really supports it, there needs to be conviction not slogans and public opinion, he said. If youâ€™re scared of sanctions and international backlash, donâ€™t vote for the EFF, Malema said at the presser. He added that for everything good comes the pain before. Donald Trump has not said anything extreme. There is worse to come. Malema said the EFF is prepared to die for the land. The party expects death and poverty if the law is passed. But like he reiterated, the EFF is not scared.